No one can predict exactly when a volcano will erupt and with so many active volcanoes worldwide there is bound to be one or more erupting at any given time. In the US alone, there are 169 of which 54 are currently on a very high or high threat to public safety alert. This threat is the combination of hazards; the destructive natural phenomena and exposure to people and property. Most are found along the edge of the Pacific Ocean, known as the 'Ring of Fire', with hot spots on island chains such as the Hawaiian, Marquesas, Society, Pitcairn, Samoan, and Galapagos archipelagos. The ones along the Pacific Rim are related to plate boundary processes. As the name "ring" implies, these islands are simultaneously active along a line, whereas hot spot volcanism is active only at small "spots." Click here for an interactive map showing the names, elevations, and last eruption of the ones along the "Ring of Fire". They are mountains that opens downward to a reservoir of molten rock below the surface of the earth. Unlike most mountains, which are pushed up from below, they are built up by an accumulation of their own eruptive products, which creates hazards to everything within a 20 miles radius. The eruptions range from relatively calm, non-violent extrusion of lava flows on the earth's surface to the highly explosive, with violent ejection of fragmented volcanic debris called tephra, as high as 80 or 90 kilometers. 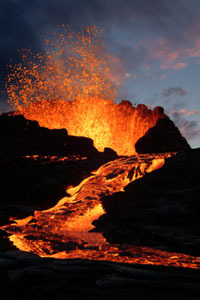 One of the factors underlying the type of eruption is the composition of the magma (molten rock) underlying the volcano. When pressure from gases within the molten rock becomes too great, an eruption occurs. These eruptions produce lava flows, flattened landscapes, emit poisonous gases, and produce flying rock and ash, as seen with the eruption of Mt. St. Helen's. See video below with footage of the eruption. The eruptions can be accompanied by other natural hazards; earthquakes, mudflows and flash floods, rock falls and landslides, acid rain, fire, and (under special conditions) tsunamis. Because of their intense heat, lava flows are great fire hazards. Lava flows destroy everything in their path, but most flows move slowly enough that people can move out of the way. However, a sideways directed explosions, known as "lateral blasts," can shoot large pieces of rock at very high speeds for several miles. These explosions can kill by impact, burial, or heat. They have been known to knock down entire forests. Fresh ash, made of pulverized rock, can be abrasive, acidic, gritty, gassy, and odorous. While not immediately dangerous to most adults, the acidic gas and ash can cause lung damage to small infants, to older adults, and to those suffering from severe respiratory illnesses. The ash can damage machinery, including engines and electrical equipment. Ash accumulations mixed with water become heavy and can collapse roofs. The ash can affect people hundreds of miles away from the cone of a volcano. This happened with the eruption of Mt St. Helen's in 1980. The NORMAL / GREEN icon is used when a non-erupting volcano is exhibiting typical background activity (including steaming, seismic events, thermal feature, or degassing), as long as such activity is within the range of typical non-eruptive phenomena seen at the volcano. The ADVISORY / YELLOW icon is used when one is exhibiting signs of elevated unrest above known background activity. The WATCH / ORANGE icon is used when it is exhibiting heightened or escalating unrest with increased potential of eruption, timeframe uncertain OR an eruption is underway that poses limited hazards including no or minor ash emissions. The WATCH / RED icon is used when an eruption is underway that poses limited hazards to ground-based communities but includes significant emission of ash into the atmosphere that could affect aviation. The WARNING / RED icon is used when a major eruption is imminent, underway, or suspected with hazardous activity both on the ground and in the air. The most recent volcano to erupt in the US is Mt. St. Helen's. A magnitude 4.2 (Richter Scale) earthquake on March 20, 1980, at 3:47 p.m. Pacific Standard Time (PST), preceded by several much smaller earthquakes beginning as early as March 16, was the first substantial indication of Mount St.Helens' awakening from its 123-year sleep. See the video below of actual eruption footage. Earthquake activity increased during the following week, gradually at first and then rather dramatically at about noon on March 25. The number of earthquakes recorded daily reached peak levels in the next 2 days, during which 174 shocks with magnitudes greater than 2.6 were recorded. Many hundreds of smaller earthquakes accompanied these larger events, the largest of which were felt by people living close to the Mt St Helens. Aerial observations during the week of seismic buildup revealed small earthquake-induced avalanches of snow and ice, but no sign of an eruption. With a thunderous explosion, or possibly two nearly simultaneous ones, widely heard in the region at about 12:36 p.m. PST on March 27, Mount St. Helens began to spew ash and steam, marking the first significant eruption in the conterminous United States since that of Lassen Peak, California, from 1914 to 1917. The crown of the ash column rose to about 6,000 feet above the volcano. The initial explosions formed a 250-foot-wide crater within the larger, preexisting snow- and ice-filled summit crater, and new fractures broke across the summit area. At Mount St. Helens, the "uncorking" unleashed a tremendous, northward-directed lateral blast of rock, ash, and hot gases that devastated an area of about 230 square miles in a fan-shaped sector north of the volcano. The explosion was as large as 500 small atomic bombs. To the south, the devastated area was much less, extending only a small distance downslope from the summit. The eruptive column fluctuated in height through the day, but the eruption subsided by late afternoon on May 18. By early May 19, the eruption had stopped. By that time, the ash cloud had spread to the central United States. See below for one person's account of that day. Were you there too - tell us your 'Story'. Two days later, even though the ash cloud had become more diffuse, fine ash was detected by systems used to monitor air pollution in several cities of the northeastern United States. Some of the ash drifted around the globe within about 2 weeks. After circling many more times, most of the ash settled to the Earth's surface, but some of the smallest fragments and aerosols are likely to remain suspended in the upper atmosphere for years. Stay away from active sites. If you live near one, active or dormant, be ready to evacuate at a moment's notice. Follow the evacuation order issued by authorities and evacuate immediately from the area to avoid flying debris, hot gases, lateral blast, and lava flow. Be aware of mud flows; the danger from a mudflow increases near stream channels and with prolonged heavy rains. Mud flows can move faster than you can walk or run. Look upstream before crossing a bridge, and do not cross the bridge if a mudflow is approaching. Avoid river valleys and low lying areas. Remember to help your neighbors who may require special assistance with infants, elderly people, and people with disabilities. Use a dust mask like a Readi Mask or hold a damp cloth over your face to help with breathing. Stay away from areas down wind from the volcano to avoid volcanic ash. Smithsonian / USGS Weekly Activity Report - The data presented in this section have been compiled by Smithsonian volcanologists over the past three decades and represent an updated electronic version of Volcanoes of the World (Simkin and Siebert, 1994). World Organization of Volcano Observatories - WOVO is an organization of and for volcano observatories of the world. Members are institutions that are engaged in volcano surveillance and, in most cases, are responsible for warning authorities and the public about hazardous volcanic unrest. Webcams- John Seach - Volcano Live website is created by Australian scientist and volcano adventurer John Seach. It is the world's first volcano news and travel website. The site contains over 3200 pages of information.